Use the guidelines below to learn about the practice of close reading. When your teachers or professors ask you to analyze a literary text, they often look for something frequently called close reading. Close reading is deep analysis of how a literary text works; it is both a reading process and something you include in a literary analysis paper, though in a refined form. Fiction writers and poets build texts out of many central components, including subject, form, and specific word choices. Literary analysis involves examining these components, which allows us to find in small parts of the text clues to help us understand the whole. For example, if an author writes a novel in the form of a personal journal about a character’s daily life, but that journal reads like a series of lab reports, what do we learn about that character? What is the effect of picking a word like “tome” instead of “book”? In effect, you are putting the author’s choices under a microscope. The process of close reading should produce a lot of questions. It is when you begin to answer these questions that you are ready to participate thoughtfully in class discussion or write a literary analysis paper that makes the most of your close reading work. Close reading sometimes feels like over-analyzing, but don’t worry. Close reading is a process of finding as much information as you can in order form to as many questions as you can. When it is time to write your paper and formalize your close reading, you will sort through your work to figure out what is most convincing and helpful to the argument you hope to make and, conversely, what seems like a stretch. This guide imagines you are sitting down to read a text for the first time on your way to developing an argument about a text and writing a paper. To give one example of how to do this, we will read the poem “Design” by famous American poet Robert Frost and attend to four major components of literary texts: subject, form, word choice (diction), and theme. If you want even more information about approaching poems specifically, take a look at our guide: How to Read a Poem. As our guide to reading poetry suggests, have a pencil out when you read a text. Make notes in the margins, underline important words, place question marks where you are confused by something. Of course, if you are reading in a library book, you should keep all your notes on a separate piece of paper. If you are not making marks directly on, in, and beside the text, be sure to note line numbers or even quote portions of the text so you have enough context to remember what you found interesting. 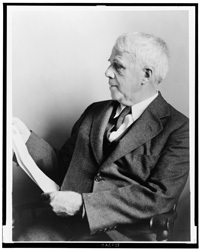 Robert Frost, 1941. Library of Congress. The subject of a literary text is simply what the text is about. What is its plot? What is its most important topic? What image does it describe? It’s easy to think of novels and stories as having plots, but sometimes it helps to think of poetry as having a kind of plot as well. When you examine the subject of a text, you want to develop some preliminary ideas about the text and make sure you understand its major concerns before you dig deeper. In “Design,” the speaker describes a scene: a white spider holding a moth on a white flower. The flower is a heal-all, the blooms of which are usually violet-blue. This heal-all is unusual. The speaker then poses a series of questions, asking why this heal-all is white instead of blue and how the spider and moth found this particular flower. How did this situation arise? The speaker’s questions seem simple, but they are actually fairly nuanced. We can use them as a guide for our own as we go forward with our close reading. Furthering the speaker’s simple “how did this happen,” we might ask, is the scene in this poem a manufactured situation? The white moth and white spider each use the atypical white flower as camouflage in search of sanctuary and supper respectively. Did these flora and fauna come together for a purpose? Does the speaker have a stance about whether there is a purpose behind the scene? If so, what is it? How will other elements of the text relate to the unpleasantness and uncertainty in our first look at the poem’s subject? After thinking about local questions, we have to zoom out. Ultimately, what is this text about? Form is how a text is put together. When you look at a text, observe how the author has arranged it. If it is a novel, is it written in the first person? How is the novel divided? If it is a short story, why did the author choose to write short-form fiction instead of a novel or novella? Examining the form of a text can help you develop a starting set of questions in your reading, which then may guide further questions stemming from even closer attention to the specific words the author chooses. A little background research on form and what different forms can mean makes it easier to figure out why and how the author’s choices are important. Why use an Italian sonnet? Why use an unusual scheme in the sestet? What problem/question and resolution (if any) does Frost offer? What is the volta in this poem? In other words, what is the point? Italian sonnets have a long tradition; many careful readers recognize the form and know what to expect from his octave, volta, and sestet. Frost seems to do something fairly standard in the octave in presenting a situation; however, the turn Frost makes is not to resolution, but to questions and uncertainty. A white spider sitting on a white flower has killed a white moth. How did these elements come together? Was the moth’s death random or by design? We can guess right away that Frost’s disruption of the usual purpose of the sestet has something to do with his disruption of its rhyme scheme. Looking even more closely at the text will help us refine our observations and guesses. Looking at the word choice of a text helps us “dig in” ever more deeply. If you are reading something longer, are there certain words that come up again and again? Are there words that stand out? While you are going through this process, it is best for you to assume that every word is important—again, you can decide whether something is really important later. Even when you read prose, our guide for reading poetry offers good advice: read with a pencil and make notes. Mark the words that stand out, and perhaps write the questions you have in the margins or on a separate piece of paper. If you have ideas that may possibly answer your questions, write those down, too. The poem starts with something unpleasant: a spider. Then, as we look more closely at the adjectives describing the spider, we may see connotations of something that sounds unhealthy or unnatural. When we imagine spiders, we do not generally picture them dimpled and white; it is an uncommon and decidedly creepy image. There is dissonance between the spider and its descriptors, i.e., what is wrong with this picture? Already we have a question: what is going on with this spider? Now we have a white flower (a heal-all, which usually has a violet-blue flower) and a white moth in addition to our white spider. Heal-alls have medicinal properties, as their name suggests, but this one seems to have a genetic mutation—perhaps like the spider? Does the mutation that changes the heal-all’s color also change its beneficial properties—could it be poisonous rather than curative? A white moth doesn’t seem remarkable, but it is “Like a white piece of rigid satin cloth,” or like manmade fabric that is artificially “rigid” rather than smooth and flowing like we imagine satin to be. We might think for a moment of a shroud or the lining of a coffin, but even that is awry, for neither should be stiff with death. The first three lines of the poem’s octave introduce unpleasant natural images “of death and blight” (as the speaker puts it in line four). The flower and moth disrupt expectations: the heal-all is white instead of “blue and innocent,” and the moth is reduced to “rigid satin cloth” or “dead wings carried like a paper kite.” We might expect a spider to be unpleasant and deadly; the poem’s spider also has an unusual and unhealthy appearance. The focus on whiteness in these lines has more to do with death than purity—can we understand that whiteness as being corpse-like rather than virtuous? Will whiteness play a role in the rest of the poem? How does “design”—an arrangement of these circumstances—fit with a scene of death? What other juxtapositions might we encounter? These disruptions and dissonances recollect Frost’s alteration to the standard Italian sonnet form: finding the ways and places in which form and word choice go together will help us begin to unravel some larger concepts the poem itself addresses. Put simply, themes are major ideas in a text. Many texts, especially longer forms like novels and plays, have multiple themes. That’s good news when you are close reading because it means there are many different ways you can think through the questions you develop. So far in our reading of “Design,” our questions revolve around disruption: disruption of form, disruption of expectations in the description of certain images. Discovering a concept or idea that links multiple questions or observations you have made is the beginning of a discovery of theme. What is happening with disruption in “Design”? What point is Frost making? Observations about other elements in the text help you address the idea of disruption in more depth. Here is where we look back at the work we have already done: What is the text about? What is notable about the form, and how does it support or undermine what the words say? Does the specific language of the text highlight, or redirect, certain ideas? In this example, we are looking to determine what kind(s) of disruption the poem contains or describes. Rather than “disruption,” we want to see what kind of disruption, or whether indeed Frost uses disruptions in form and language to communicate something opposite: design. Frost’s speaker brews unlikely associations in the first stanza of the poem. The “Assorted characters of death and blight / Mixed ready to begin the morning right” make of the grotesque scene an equally grotesque mockery of a breakfast cereal (4–5). These lines are almost singsong in meter and it is easy to imagine them set to a radio jingle. A pun on “right”/”rite” slides the “characters of death and blight” into their expected concoction: a “witches’ broth” (6). These juxtapositions—a healthy breakfast that is also a potion for dark magic—are borne out when our “fat and white” spider becomes “a snow-drop”—an early spring flower associated with renewal—and the moth as “dead wings carried like a paper kite” (1, 7, 8). Like the mutant heal-all that hosts the moth’s death, the spider becomes a deadly flower; the harmless moth becomes a child’s toy, but as “dead wings,” more like a puppet made of a skull. The volta offers no resolution for our unsettled expectations. Having observed the scene and detailed its elements in all their unpleasantness, the speaker turns to questions rather than answers. How did “The wayside blue and innocent heal-all” end up white and bleached like a bone (10)? How did its “kindred spider” find the white flower, which was its perfect hiding place (11)? Was the moth, then, also searching for camouflage, only to meet its end? Using another question as a disguise, the speaker offers a hypothesis: “What but design of darkness to appall?” (13). This question sounds rhetorical, as though the only reason for such an unlikely combination of flora and fauna is some “design of darkness.” Some force, the speaker suggests, assembled the white spider, flower, and moth to snuff out the moth’s life. Such a design appalls, or horrifies. We might also consider the speaker asking what other force but dark design could use something as simple as appalling in its other sense (making pale or white) to effect death. However, the poem does not close with a question, but with a statement. The speaker’s “If design govern in a thing so small” establishes a condition for the octave’s questions after the fact (14). There is no point in considering the dark design that brought together “assorted characters of death and blight” if such an event is too minor, too physically small to be the work of some force unknown. Ending on an “if” clause has the effect of rendering the poem still more uncertain in its conclusions: not only are we faced with unanswered questions, we are now not even sure those questions are valid in the first place. Behind the speaker and the disturbing scene, we have Frost and his defiance of our expectations for a Petrarchan sonnet. Like whatever designer may have altered the flower and attracted the spider to kill the moth, the poet built his poem “wrong” with a purpose in mind. Design surely governs in a poem, however small; does Frost also have a dark design? Can we compare a scene in nature to a carefully constructed sonnet? Your goal in a paper about literature is to communicate your best and most interesting ideas to your reader. Depending on the type of paper you have been assigned, your ideas may need to be organized in service of a thesis to which everything should link back. It is best to ask your instructor about the expectations for your paper. Knowing how to organize these papers can be tricky, in part because there is no single right answer—only more and less effective answers. You may decide to organize your paper thematically, or by tackling each idea sequentially; you may choose to order your ideas by their importance to your argument or to the poem. If you are comparing and contrasting two texts, you might work thematically or by addressing first one text and then the other. One way to approach a text may be to start with the beginning of the novel, story, play, or poem, and work your way toward its end. For example, here is the rough structure of the example above: The author of the sample decided to use the poem itself as an organizational guide, at least for this part of the analysis. A paragraph about the octave. A paragraph about the volta. A paragraph about the final line (14). A paragraph addressing form that suggests a transition to the next section of the paper. You will have to decide for yourself the best way to communicate your ideas to your reader. Is it easier to follow your points when you write about each part of the text in detail before moving on? Or is your work clearer when you work through each big idea—the significance of whiteness, the effect of an altered sonnet form, and so on—sequentially? We suggest you write your paper however is easiest for you then move things around during revision if you need to. If you really want to master the practice of reading and writing about literature, we recommend Sylvan Barnet and William E. Cain’s wonderful book, A Short Guide to Writing about Literature. Barnet and Cain offer not only definitions and descriptions of processes, but examples of explications and analyses, as well as checklists for you, the author of the paper. The Short Guide is certainly not the only available reference for writing about literature, but it is an excellent guide and reminder for new writers and veterans alike.